All Lacey has ever wanted is to become a successful actress, and she’s done everything she can to get there—working hard, neglecting her social life, and even swearing off love altogether. It seems like her work has paid off when she lands a leading role in a horror film alongside a superstar, until her father’s over-abundance of concern forces her to work with a tutor, Donavan Lake. It seems like Donavan’s presence will only drag her down, until someone begins to sabotage her on set, and the tutor is the only one who will help her track down the culprit—and, worse yet, he’s making her question all of her own rules about love and business. I’m pretty new to the world of Kasie West fans, admittedly; I read the first novel in this little ‘universe’ last year (Love, Life, and the List) and thought it was cute, but I wasn’t “wowed” until one of Kasie’s short stories this past Christmas became my favorite romance short of all time and put her solidly on my radar. With that track record, I went into this novel feeling like it would be the dealbreaker. Thankfully, Fame went above and beyond to convert me, and I feel pretty comfortable saying now that I’m adding Kasie West to my “auto-read” list. I’d never had to win anyone over like this and I had to admit, it made the small victories more satisfying. First of all, her narrative voice itself is wonderful; like I feel every sweet romantic contemporary should be, it’s quick-paced, light, and fun without being shallow. She gets a lovely and nuanced story across without any extras or unnecessary add-ons, which makes books like Fame perfect for busting a reading slump or binge reading in one day. Happiness was not the right word to describe how I felt. Maybe euphoric or alive. Like everything I had worked for my entire life had led me to this. On top of that, her characters? You gotta love ‘em. They’re fun, witty, complex, and interesting. Lacey is such an enjoyable protagonist; she’s arrogant and spoiled in a tongue-in-cheek sort of way—she knows she’s a pain, but she rolls with it, and it works for her character so well. Donavan is a grouchy little fluff and I loved watching him slowly open up; plus, it was nice to see a budding romance where they communicated fairly easily instead of it being a book full of back-and-forth miscommunication. Of course, Fame isn’t just a romance; it’s also a mystery story, and a pretty good one at that. The book flies by because you’re kept in solid suspense for who the saboteur is, and when the big reveal happens, it wasn’t the character or motive I assumed it would be, so that was a nice surprise. 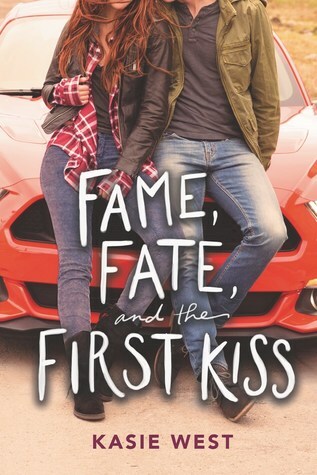 Overall, Fame, Fate, and the First Kiss was a knockout YA romance for me—it was cute, fun, a quick read, had enjoyable characters, didn’t rely on overusage of tropes, and the main character is acting in a horror movie, which was such a fun detail to the story. Anyone who enjoys fluffy, cutesy romances without problematic content or overusage of tropes, as well as anyone who’s already a fan of Kasie West or similar authors. Wonderful review Destiny! I can’t wait to read this one! Thank you, love! It was SO cute. I hope you like it! Great review! I’ve read a few of Kasie West’s books before, and totally agree that they are super quick to get through. Adding this one to my tbr! Thank you! They are such quick and fun reads. 🙂 I hope you like this one! You totally should! 😀 I hope you enjoy!